By Santiago Iñiguez de Onzoño, Executive President of IE University. Almost everyone will agree that gender diversity in the composition of the different groups of stakeholders at business schools enriches the learning experience and promotes innovation. However, there is still ample room for growth in gender diversity, as current data show. The compiled figures below show the average of women participating in three major groups of stakeholders at top business schools offering MBAs, according to information collected by the Financial Times. The good news from these stats is that the percentage of women at the top 25 MBA programs has increased by ten percent over the past decade. The other two magnitudes, though, remain flat. These and similar statistics lead some analysts to say that there is still a glass ceiling at business schools, particularly at the level of postgraduate programs. Unfortunately, this also has consequences in the number of women at top management positions in corporations, given the correlation between holding MBAs and climbing the corporate career ladder. The two main reasons frequently mentioned to justify why women do not pursue MBA programs, as often as their male counterparts, are the lack of inspiring role models in business, and that increasing business career demands seem to disrupt the desired work/life balance, particularly at critical phases in life associated to childhood and growing up a family. Welcome to the biggest cultural extravaganza at IE Business School. 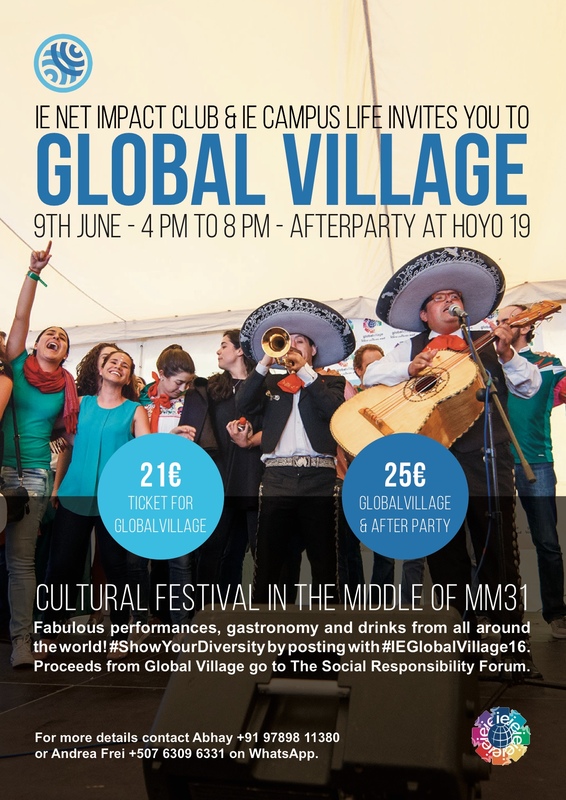 With over 90 nationalities present at campus IE is a melting pot of the world, IE Net Impact Club and IE Campus life welcome you to celebrate this diversity on 9th June from 4PM-8PM at IE Global Village 2016. After party to follow at Hoyo19!! Proceeds from the sale of the tickets go to Social Responsibility Forum. 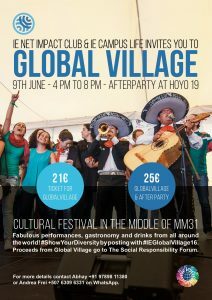 All the participants of the event must adhere to the CODE OF CONDUCT OF GLOBAL VILLAGE. Please make sure you read it before signing up for the event.